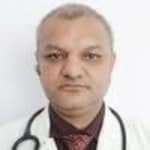 Dr. Puneet Gupta is a trusted Oncologist in Preet Vihar, Delhi. He has been a practicing Oncologist for 31 years. He is a qualified MBBS, MD - Radiotherapy, DNB - Radiotherapy . You can consult Dr. Puneet Gupta at Metro Hospital & Cancer Institute in Preet Vihar, Delhi. Book an appointment online with Dr. Puneet Gupta and consult privately on Lybrate.com. Lybrate.com has an excellent community of Oncologists in India. You will find Oncologists with more than 30 years of experience on Lybrate.com. You can find Oncologists online in Delhi and from across India. View the profile of medical specialists and their reviews from other patients to make an informed decision. I have a node on the ryt side of my breast from last two years it is painless and not increasing or decreasing in size. hello,take medicine Conium 30 every third day in morning,Asteria rubens 30 two times everyday except at the day of conium,cal.flour 6x daily in the night. Cancer is caused by abnormal uncontrolled proliferation of cells, usually caused by some faulty signals in the body which lose check over few cells and they become autonomous. It can be lifestyle related like lack of exercise, sedentary lifestyle, fatty food, hormonal imbalance, viruses, pollution, smoking, tobacco, or may be genetic. One must be careful about what we eat and what kind of environmental factors effect us in our surrounding and avoid known carcinogens. Regular screening and health check up to rule out any early disease prior to producing symptoms. Turmeric, tulsi leaves, wheat grass etc have anticancer properties. I am male, 81 years old, having prostate problem and taking one Urimax 0.4 mcg every night and have moderate difficulty in passing urine and I have to get up 4 times in the night for this purpose. And I have hyper tension (140/90) and taking Olways-AM one tablet every day. Kindly advise if I am on the right medication and can the enlargement of prostate is curable at my age? Thank you gentlemen. Is it possible to have breast cancer if some pricking in both breast 5 years back I had ca 125 infection in my uterus cyst so I have to remove my womb. CA 125 is not an infection... It is a cancer marker.. And if you had history then yes you have chances of breast cancer.. Get proper check up.. I am 21 years old female. I have a doubt regarding the consumption of caffeine (through tea or coffee). Does caffeine have any affect in breast infections or cancer because I am a bit addicted to coffee. Caffeine as far as I know doesn't have carcinogenic potential rather some feel it has protective role. Though it may be related to hypertension, anxiety disorders acidity but so far it is not considered carcinogens. Hi sir Actually I had got mild grade 1 prostate in scan report doctor prescribed to take urimax 0.4 tablet what is grade 1 prostate and its is serious sir. Regards. Grade 1means your prostate is slightly increased in size. And if you are symptomatic, then take tablet urimax as advised. Hi, I do not have lump in my breast but still from my breast. It produce water like a drop. Before that I was pregnant but I took misoprostol at that time from my breast milk was producing. It can be the side effects of misoprostol. You can consult me at Lybrate for homoeopathic treatment. I am 74 years male, have some prostate enlargement; with the result frequent urinate in night especially during winter. Summer is not much problem for urinating. I also have problem of large sneezing. I have no sugar problem and my bp ranges from 135 to 150. Can you suggest simple home made treatment for this. Sir prostate enlargement can be benign or malignant. It needs evaluation by serum psa levels, sonography, and transrectal multiple core biopsy for confirmation. If it is benign can be started on some medications or else treatment as per the diagnosis. My mother age is around 49, she had a biopsy and it was positive she has a cervical cancer in 2b stage what will be the cost of surgery, should she undergo only surgery or radiation therapy could you please suggest. You should consult an oncologist and take proper advise. Diseases like cancer cannot be advised like this. My other advise is to take homoeopathic treatment side by side. It is the best way to reduce the complications and get healthy fast. I am 66 years old and got operated for prostate. My prostates were very large as per doctor version. After operation 5 years have been lapsed but I feel still leakage at night and my cloth get wet. I also feel weakness in sexually involvement. There is no sugar problem and at fast it is 99. And uric acid is 6.2. There are many lifestyle and dietary guidelines that can be followed to protect against future flares or prevent gout or uric acid problems from occurring in the first instance: maintain a high fluid intake (2-4 liters a day) avoid alcohol maintain a healthy body weight eat a balanced diet limit fish, meat and poultry intake. If attempting to lose weight, avoid low-carbohydrate diets. If carbohydrate intake is insufficient, the body is unable to burn its own fat properly, releasing substances called ketones into the bloodstream. This results in a condition called ketosis that can increase the level of uric acid in the blood. It is most important to avoid foods that are high in purines, to ensure that the levels of uric acid in the blood do not get too high. Here is a list of high-purine foods to be wary of: beef kidneys brains dried beans and peas liver mackerel mushrooms lose some weight by walking or other exercise, avoid meats and get always be on a prescribed diet as prescribed by a registered dietitian. I am a registered dietitian, certified diabetes educator and a doctor, consult privately for detailed treatment plans using diet and medications.